Saddleback is in Dallas Plantation, Maine which is just outside of Rangeley. Saddleback is big, topping out at 4,000 vertical feet and over 2,000 foot vertical drop. Saddleback has made some good investments to its on-mountain infrastructure over the past few years. If you arrive early enough on a weekend (before 9AM) parking is generally good. You can drop off your gear at the lodge and go park which saves a big gear schlep from the car. The lots do fill up on busy days but there is a bus shuttle that can help if you have to park on the access road. The lodge is a very pretty post and beam structure - but it is too small on busy days. It can be very congested during lunch and the end of the day. Eat lunch early and enjoy the skiing while everyone else is eating. However, a visit during the mid week the Lodge is a great place to relax next to the fireplace during your ski day. I give a grade of a B+ for parking access and a B for the day lodge. I have a love hate relationship with the Saddleback lifts and crowds. I love the fact that Saddleback's trails are uncrowded even on a busy day. Why are they uncrowded? They don't have the lift system to move loads of people up the mountain. So skiing down trails is typically a wide open, peaceful experience and the snow stays fresh all day. However, when it is busy, the lift lines can get crazy long which which isn't so good. Don't let this scare you away though - there are way too many positives about this mountain that makes it a can't miss. I give a grade of an A for trail crowding and a C for lift infrastructure. Saddleback has the best beginner terrain in Maine hands down. A newer Quad services numerous beginner trails below the base lodge separated from the more advanced trails and skiers. There are even beginner glades and a terrain park. $29 gets you a lift ticket to the beginner chair. If you want to learn to ski, Saddleback is a GREAT option. I give a grade of an A+ to the beginner terrain. Saddleback is not what I term a "Blue Cruiser" mountain. Beginners wanting to make the step up to intermediate are going to be facing some challenging intermediate terrain up on the mountain. I think if they ever expand the lift and trail system to undeveloped parts of the mountain easier intermediate terrain will be made available. Once you get over the intermediate hump however, the entire mountain opens up. I give a grade of a B- to the intermediate terrain only because there isn't great step-up intermediate terrain for beginners. Once you master Saddleback's intermediate runs, you can have a lot of fun. Saddleback has a modest but very nice terrain park serviced by its own lift. There are some very good features in the park and there is a constant crew setting up new stuff each weekend. It should certainly satisfy any terrain park junkies in your family. Seems like newbies as well as terrain park veterans are welcome. I give a grade of a B+ to the terrain park. Yes, Yes and Yes. Saddleback's Expert terrain is outstanding. From both the mid-mountain double and top of Mountain Quad, you have outstanding choices. Saddleback is famous for its winding, narrow bumped trails. If you are an expert skier that likes natural, un-groomed trails, you will not be disappointed. Saddleback doesn't have lots of groomed expert terrain like its neighbor Sugarloaf does - so groomer expert skiers might not be as happy. More Yes, Yes and Yes. Saddleback + Glades = Outstanding. You can find great gladed terrain from all lifts. Saddleback glade cutters have a knack for getting it just right, and skiing through the trees on a powder day is what it is all about. It's one of my joys in life to chase my boys through the glades of Saddleback hooting an hollering all the way down the glade. Check out the resort web page for the latest pricing information but they are a good deal (especially in the junior season pass options). Saddleback has great option for Maine honor roll students - a PEAK season pass for a substantial discount. 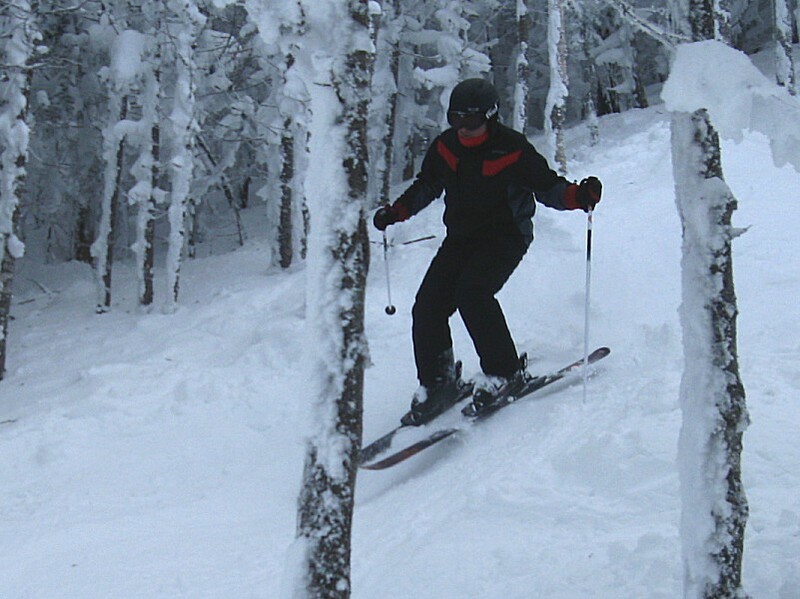 Keep an eye on their website for lift ticket deals and special Maine resident Sunday ticket deals. I give a grade of an A- for lift ticket pricing. 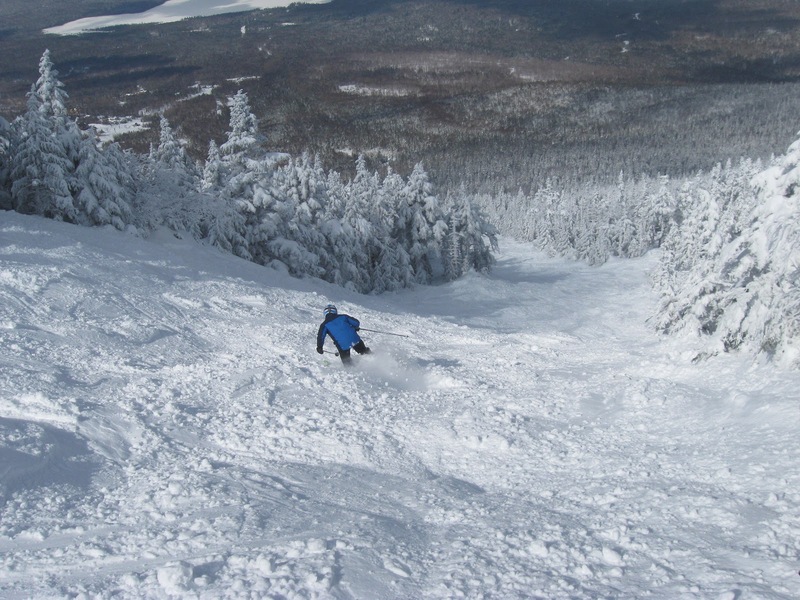 After skiing many of the alpine mountains in Maine, we settled on Saddleback as our favorite mountain and we are all season pass holders. The vibe at Saddleback is pure Maine. If you have old beat up equipment - no one cares. If you want to ski in wool pants and flannel - more power to you. It is not a fashion show on the slopes - it is just pure Maine skiing. The way "skiing" should be I guess. Take that and the outstanding skiing, scenery and staff and you have a great mountain in Maine. Overall - I give Saddleback a ranking of an A-. A can't miss mountain. An accurate review. The comments about the lifts and intermediate terrain are spot-on. My two teenagers just learned to ski this season and we made our fifth trip to Saddleback last Sunday. While the beginner terrain was FANTASTIC, the mountain's choices for us now that the kids are at the intermediate hump poses some challenges. That being said, I've never skied a friendlier mountain and there is enough blues to keep the kids interesting. For rentals, I'd point folks to Powder Dreams Ski Shop, where you can rent solid gear (Head Edge boots, Head Peak 2 skis) for $25. The staff there is AWESOME and we just picked up two sets of demo skis at a great price. Thanks for the comments. Once your kids make it over the hump you are going to have a lot of fun at Saddleback. I think the devils off the T-BAR (Red and Blue) are good trails to practice on.